Who is that masked frog? Chances are it's a wood frog. A dark band over its eyes makes this brownish frog resemble a robber. You can find it in woods and associated wetlands. General description: This brown, palm-sized frog has a dark patch over its eyes and two big ridges (dorsolateral folds) run down its back. Size: The wood frog is 2 inches to 2 3/4 inches long. Color: A dark, masklike patch extends backwards from the eyes. Skin coloration is typically brown, but can range from shades of reddish-brown to almost black. Sounds: Often the first species heard calling in the spring. Their short chuckle is a harsh racket, racket, racket. A chorus sounds like the feeding call of the mallard. Males have paired vocal sacs. Males and female wood frogs gather in ponds to breed early in the spring, even before the ice is gone. The only way a male can tell if another frog is a fertile female is to clasp it. If he discovers the frog he has clasped is thin, he knows it's either another male or a female that has already released her eggs. After mating, the female lays a blob of 1,000 to 3,000 eggs. Egg masses are often laid communally and hatch within three weeks, depending on the temperature. Tadpoles take about six to nine weeks to turn into frogs. 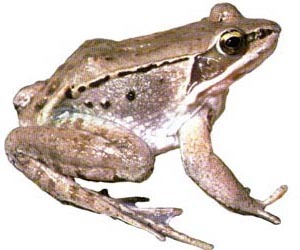 As their name implies, wood frogs live in forested areas such as those found in northern Minnesota. They can be found under logs and rocks far from water, or in ponds. They breed in wetlands, lakes, and stream backwaters, and overwinter under fallen leaves on the forest floor. In Minnesota, wood frogs are found in the northern, east-central, and southeastern part of the state. Breeding habitat: Bogs, temporary forested wetlands, margins of forested lakes, and backwaters of streams. Summer habitat: Occupies woodland and forest habitat, sometimes traveling a considerable distance from water. Winter habitat: Terrestrial, tolerating partial freezing of body fluids. Overwinters in leaf litter of the forest floor. Wood frogs have no special status in Minnesota. Wood frogs are well suited to a cold climate. They spend winters burrowed in the leaves that fell the previous fall. They stop breathing, their hearts stop beating, and ice crystals form within their hibernating bodies. A special antifreeze they produce keeps liquids from freezing inside their cells and killing them. Their fertilized eggs are not harmed by freezing either. Egg development simply stops until the water warms again. The wood frog is the only frog found north of the Arctic Circle. Another fun fact: wood frog tadpoles can tell their brothers and sisters from other tadpoles.